It has been a more than 30-year custom for Radio City Music Hall in New York to make a "living Nativity" scene in preparation for Christmas. This year four Rockettes – an American version of the French Cancan dancers of the Moulin Rouge cabaret – were present to welcome the animals in the building's lobby. On November 5, 2015, Cardinal Timothy Dolan, Archbishop of New York, passed by at that exact moment to "bless the animals." So – what a coincidence! 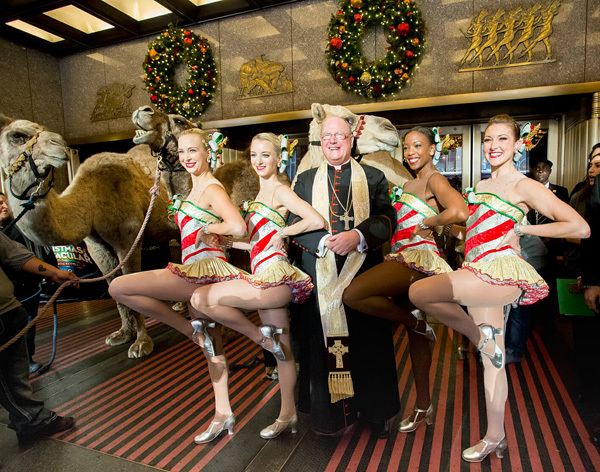 – he also met the Rockettes and took advantage of the opportunity to embrace them and have them rub their thighs and buttocks on his cassock. What a good example! What a grace to have such a chaste and restrained Cardinal following in the moral footsteps of our austere and serious Pope!